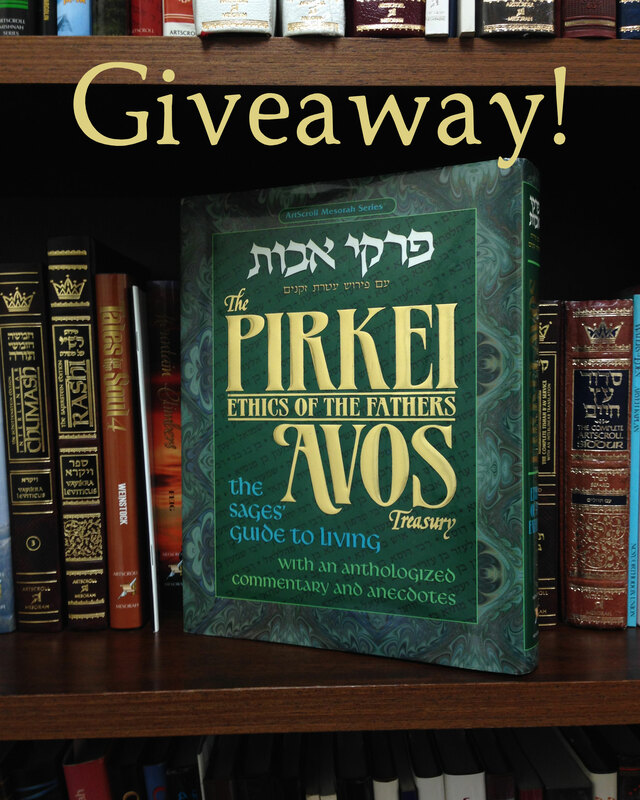 The Pirkei Avos Treasury – Giveaway! We hope that all of our readers and fans had a wonderful and meaningful Pesach. Now it’s time to look towards the period between Pesach and Shavuos, when it’s customary for Jews to read one chapter each week from Pirkei Avos, Ethics of Our Fathers. Giveaway is over! Congratulations to Adam and Chava Simon on winning! One of ArtScroll’s best-selling Pirkei Avos volumes is The Pirkei Avos Treasury. Between the covers of this magnificent, oversized coffee-table volume lies anthologized commentary and anecdotes that bring the lessons of Pirkei Avos down to earth and into our lives. The Pirkei Avos Treasury is a meaningful gift for anyone in your life who enjoys learning and growing. And now, just in time to learn Pirkei Avos this year, ArtScroll is giving one of it’s readers the gift of this beautiful volume – a $59.99 value! Click here to shop all Pirkei Avos by ArtScroll. Click here for exclusive online savings on The Pirkei Avos Treasury. Subscribe to the Official ArtScroll blog via email (link on the right sidebar) and leave a comment on this post letting us know you subscribed. **Giveaway ends on Sunday, April 27th at 11:59 pm eastern time. Prize can be shipped within the USA. Winner will be notified via email. Valid email address must be provided to claim prize. Limit one entry per person. I’m subscribed ! Thank you for this giveaway and all your work ! Please Hashem, let me be a Winner! Subscribed; Facebook liked and commented; thank you for Pirket Avot book offer. Subscribed! Hope you pick me! This is an amazing deal and I subscribed thank you Artscroll. I am and have been subscribed forever…Big Fan of Artscroll. Hope I win!!! I subscribed! Looking forward to learning Pirkei Avos again! I subscribed, thank you for the opportunity! Nice prize – hope I have a good chance!